Nylon line is 4m, able to be cut to properly fit within the confines of your business! 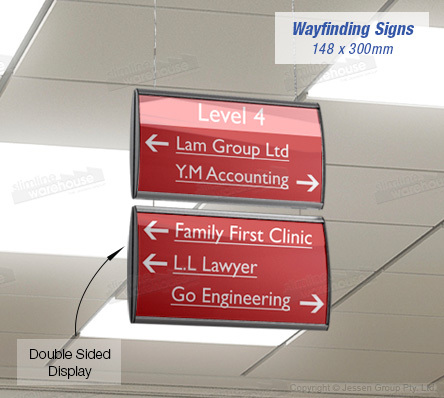 Suspended ceiling signs help visitors find their way around your location, thanks to the (4) 148 x 300mm signage holders included with purchase. These sign displays can be be placed on both sides to create a dual-sided display that is seen by passersby in multiple directions to maximise exposure. The hanging interior display has 4m of nylon line to hang the display at the right height to be easily viewed by visitors to your location. These wayfinding office systems, suspended ceiling signs utilise a protective lens on each sign holder to keep graphics clean and looking great during use. A suction cup tool is provided to remove the lens for graphic changes or to clean any accumulated dirt off of the lens. There is a hardware kit provided as well that makes installation in any location easy, without the hassle of having to hire a professional! Order hanging wayfinding systems today to help visitors to museums, airports, retail stores, exhibition halls, universities, transit stations, and airports.